by Dr Rees revealing active inflammation. Rheumatologists are experts and diagnosing and relieving the pain and suffering associated with all forms of arthritis. Early and accurate diagnosis is essential in Rheumatological conditions for the best possible patient outcome. Conditions I treat include osteoarthritis, rheumatoid arthritis, gout, back pain and osteoporosis. I trained at several London Teaching Hospitals including Guy’s and St Thomas’, St George’s and Bart’s and the Royal London. I was previously Honorary Consultant Rheumatologist at Guys’ and St Thomas’ Hospitals and I am currently Consultant Rheumatologist at Addenbrooke’s Hospital in Cambridge. 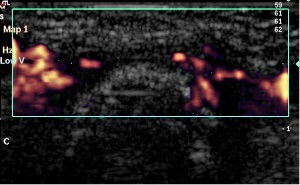 I am one of very few Rheumatology Consultants qualified in performing Musculoskeletal Ultrasound. This often allows me to diagnose patients earlier and adjust their treatment more accurately than has previously been possible.